Happy Wednesday, Prayer Doulas! I hope y’all had a good week. I was on the road for almost 9 hours today (Tuesday), and I am w-i-p-e-d, so I’ll make this short and sweet and packed with (hopefully-not-empty) promises of having lots more details next week. EDIT: Just found out that our Lucille who just gave birth to baby Sara at age 52 has TWELVE children. 11 are living and the oldest is 36. Read Tara’s post here. 2. I have something really cool to share today. My online friend Erin MacPherson‘s new book released Monday. 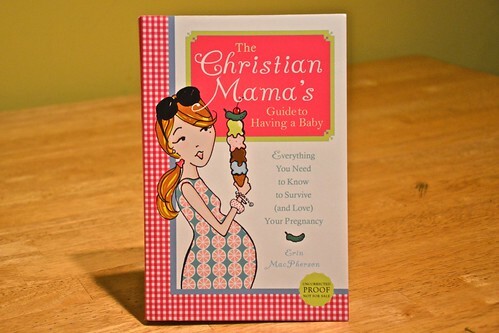 It’s called The Christian Mama’s Guide to Having a Baby. 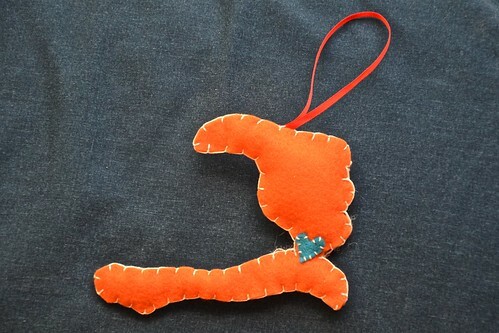 If you’re pregnant or love someone who is, this would make a fabulous gift. And I have a super-special deal for you today. The first four people to e-mail me that they’d like to make a $10 donation to Heartline Haiti will get a free copy of the book sent to you (or a friend). 3. Remember the beautiful Africa and Cambodia ornaments my friend Megan is making to raise money for their adoption? Well, someone contacted her about making some for Haiti, and when she told me about it, I jumped up and down and begged her to make me one. I now have a giraffe-print Africa ornament, a blue & red Cambodia ornament (that matches my blog) ,and this awesome orange Haiti ornament. I thought this would be a really cool reminder to pray for our Expectant Mamas in Haiti. If some of you are interested in purchasing one, Megan has graciously agreed to make as many as she can before they go pick up Emelia from Ethiopia. They would be $6 (+ $1 shipping) with 1/2 of the proceeds going toward their adoption and the other 1/2 to Heartline. If you’re interested, let me know in the comments or e-mail me. Haiti is a challenging one to make, and I don’t want her to make more than we need. 4. A Prayer Doula e-mailed me a few days ago with some very interesting observations: I had a couple of ideas dance through my mind as I was reading Expecting last night. It is great for women here in North America, but it doesn’t touch on a few issues that would be specific to the third world… like praying for an adequate supply of fresh water… praying for the support of the baby’s father or the mother’s parents or whatever… praying for adequate food and rest while these mothers are living in tent cities or where ever they are right now… What about making a downloadable bookmark to keep these needs on the forefront of our minds as we pray through the other physical needs? Somebody who is good at digital scrapbooking could pull that off. Anyone want to take on that challenge? EDIT: My cousin Jen was having some of those exact same thoughts this week^. Love this post she wrote. That’s all I’ve got today. Feel free to share any thoughts/sugggestions! Happy Bump Day! p.s. Thanks so much for praying for Nina and me and our trip to Indiana! Recap on the blog tomorrow! Marla ~ I sent you an email on Facebook and wanted to here as well. Is it too late for me to order a Haiti ornament???? Thanks so much for posting about my book… you’re SO nice!! Oh my word. FOR SURE!! Love you. Thank you for this project!! Loved your post, Jen! I edited mine to include your link. I would like a Haiti ornament. My husband has taken a strategy coordinator position at our Church for Haiti and we’re praying as a family about some opportunities there. Would love to hang it on our family bulletin board to remind us to pray more often. Plus to remind me to pray for Venette and Yolette all throughout the day. Any color is fine. I’ll use your paypal link to pay. I so enjoy reading your blog and your different ministries and opportunities to join you where God is working. Thanks for sharing! I definitely want a Haiti ornament. I had also been thinking the same thing . . . about how the needs of these mamas are different from ours. I can’t do the scrappy thing, but I think that is a WONDERFUL way to keep their needs in mind. What color combo do you want, Meg, and I’ll get you hooked up. Would it be greedy to request 2 Haiti ornaments? I sponsor a little boy in Haiti and would love to send one to him and his family. I would enjoy one for me as additional reminder to pray faithfully for this country in great need. If only one is possible, I promise to send it to little Jaclin. Two it is! Do you have specific color combos you’d like? I think she has pretty much every color. Erin’s choice. Just need to make sure one is boyish, whatever that means. Is payment through you or direct to Erin? It’s actually Megan. 🙂 You can send me the payment and I’ll get it to her. It will be $14, and you can do paypal http://taviano.com/paypal or mail a check. E-mail me (click that link up there) and I’ll give you my address. I forgot to ask you–the heart on my ornament is on Port-au-Prince. Where do you want yours? Where does Jaclin live? I’m going to make a new category for you. People I Love Despite Their Smart-Mouthed Sarcasm. Love the prayer doulas list of needs! And yes, congrats to Erin (luv her) I pray her book touches minds and heart everywhere for the Lord. I put my the name of the gal I’m praying over in my WIP. Every time I go to write I pray for her first. I think adding a needs list is a brilliant idea. Glad you survived your trip! What a GREAT idea about your WIP, Tana!! Thanks for doing that! !